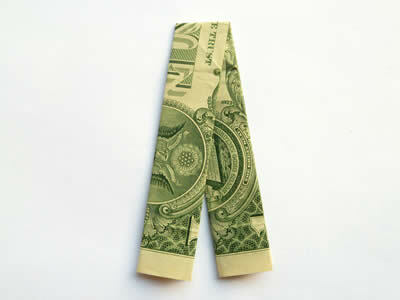 Let me show you two neat ways of folding money origami trousers. 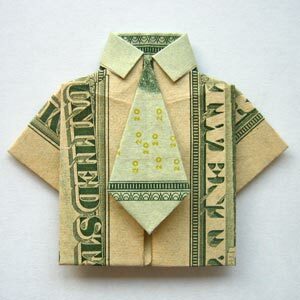 Pants, slacks, trousers, whatever you want to call them, I'll show you how to fold them out of money. They make a neat way to leave a tip or give a cash gift. 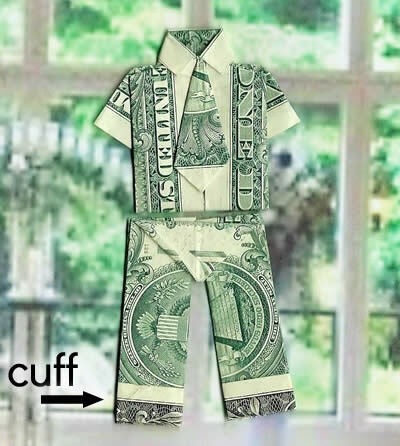 The great thing about both these designs is that they're the perfect size to match a money origami shirt, so you can give someone a complete outfit. The simple trousers are super easy to fold, and look like this. Fold the bill in half lengthwise and unfold again. 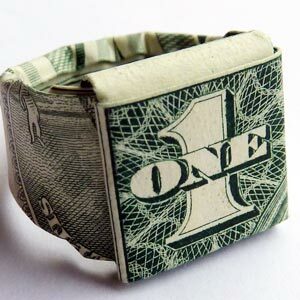 Fold the top and bottom edges of the bill in to the center. 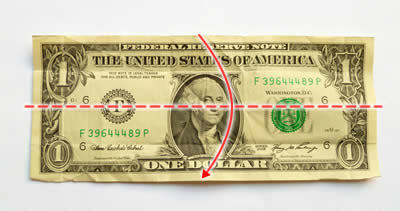 Fold the bill in half lengthwise. 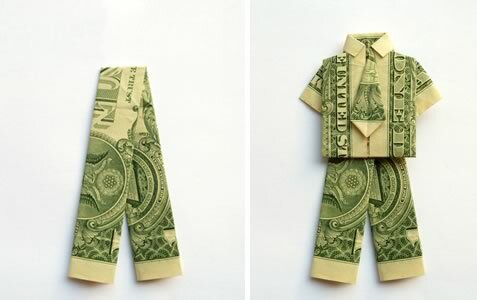 Fold the bill in half at a slight angle to finish the trousers. This design was shared by a reader named Max, who says he came up with it once when he was stuck on a bus for 5 hours. Sounds like a good way to use the time :-) Thanks for sharing your design Max! A visitor named Nancy wrote in to say that she'd made a variation on Max's trousers, by folding up the bottom to make a cuff on the trousers, which I think looks fabulous (see pic below). Thanks for sending in your photo Nancy! 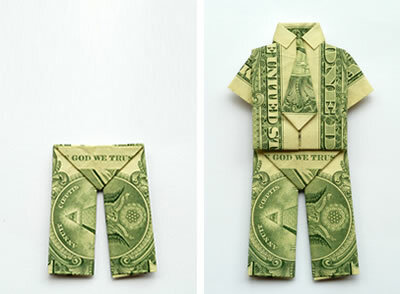 I hope you enjoyed making these dollar origami trousers. If you have any questions or comments, or just want to say hi, then please contact me with this handy form . 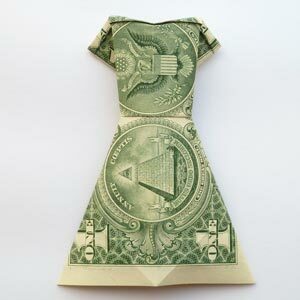 Or check out my full list of money origami tutorials.